This is the fifth and last in a series of articles providing a chapter-by-chapter in-depth “book club” reading of Tom DeMarco and Timothy Lister’s book “Peopleware”, 2nd edition. The final sixth part has been added to the second edition, some ten years later. It contains a revision of the first five parts and some additional organizational insights. The paragraphs here are going from the harm done by the motivational posters and overtime to a re visit of the things to avoid when growing teams ( they include annual merit reviews, individual praises for extraordinary accomplishments, awards and bonuses tied to performance and in general any performance measurement). The point is that these simplistic motivators excuse managers from harder matters such as investment, direct personal motivation and coaching, thoughtful team formation, staff retention, ongoing analysis and redesign of work procedures. One entire chapter is dedicated to process improvement programs as the CMM. From one side they are a worse version of the “big M” methodology (worse because not anymore company wide but world and industry wide) and on the other side they move away responsibility from the individual to the organization and organization themselves become more and more averse to risk as they mature. Cloud Computing is the new hype, a term which is actually quite ambiguous. 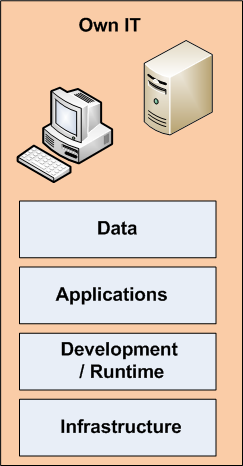 Wikipedia definition is : Cloud computing is Internet-based computing, whereby shared resources, software and information are provided to computers and other devices on-demand, like the electricity grid. It’s a very generic term, which comprises different services (infrastructure, applications) and typologies (public clouds, private clouds) but it’s definitely a booming sector. In this post I just wanted to clarify the cloud service layering. This is the fourth in a series of articles providing a chapter-by-chapter in-depth “book club” reading of Tom DeMarco and Timothy Lister’s book “Peopleware”, 2nd edition. A jelled team is a group of people so strongly knit that the whole is greater than the sum of the parts, built around a goal. Signs for a jelled team are the low turnover, the strong sense of identity, a sense of eliteness, the joint ownership of the built product and obvious enjoyment.